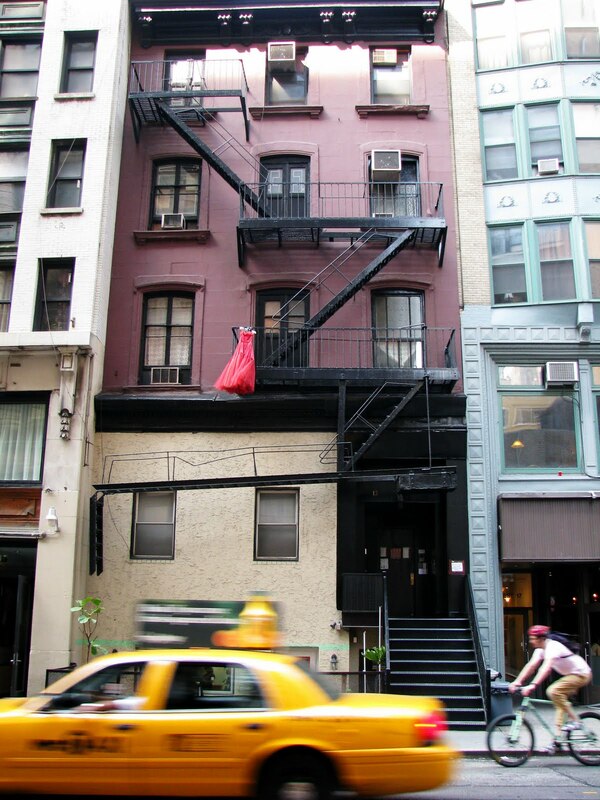 I am out for a walk on a beautiful spring afternoon when I spot you, hanging on a fire escape. So whimsical and unexpected, you stop me in my tracks. Who put you there, and why? No one notices you but me. A constant stream of people walk right beneath you on the crowded street and never look up. Taxi cabs and bicycle riders zoom by, unaware of your presence. Suddenly, a strong breeze blows. 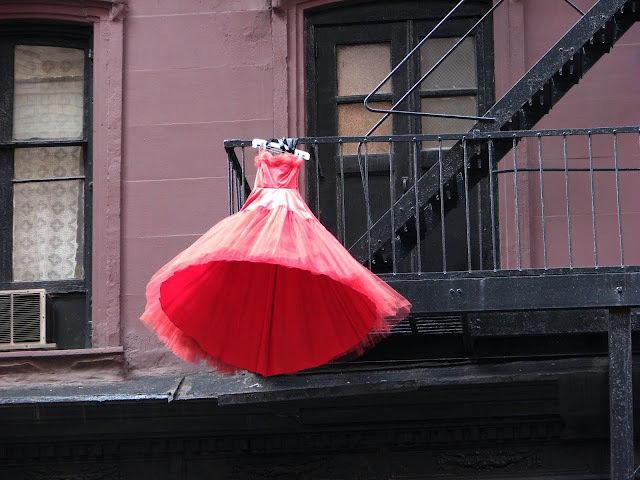 Your skirt billows out and you dance in the wind. You don't need any music. You just move to the rhythm of the city. 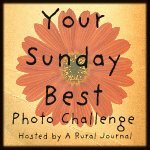 Linking up today with Sundays In My City, Your Sunday Best and Sunday Snapshot. I love the photos and your narrative! This is just so fabulous! Wonderful photo narrative. I've been to "the city" only once, but I loved seeing this type of image. Your captures are special. This, I love. Seriously lovely. You find the poetry and music in the city and you capture it so perfectly with your camera. Such a joy. I just love this, such a great find! Beautiful! I love it when you capture moments like that. That's the sign to let you know a Shareen Vintage store is there... Have you heard of her? She has a show on PlanetGreen (?) called Dresscue Me. She hunts for old clothes, then updates and sells them as vintage...really cool stuff. These images are fun!!! Go check out her store. Well, this is just awesome. Love the spontaneity of this series. You done good! Love your new header too. Thanks so much for sharing your photo with us at YSB, UM. I truly appreciate it! What a beautiful capture. I love it! 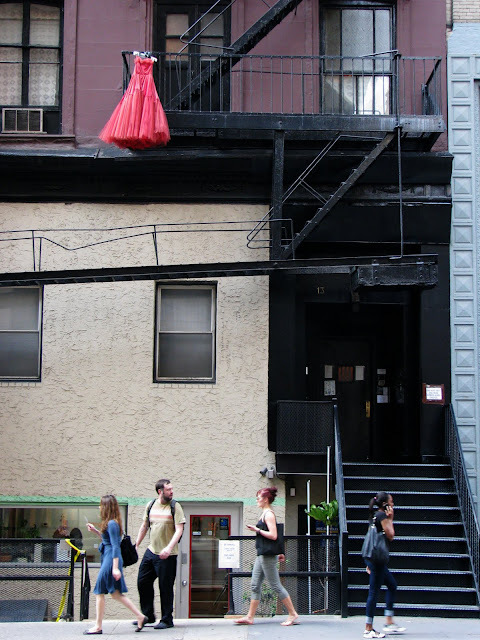 What an absolutely wonderful post--you make me want to go out with my camera and look for whimsical things! That is a fabulous shot! Love it! Wonderful picture story, good job! Love the narrative and the photos are great! Awesome. And bright red too... I love your eye for the random in the city. Almost polar opposite of what I see out here in the country. Thanks for the view! I think we all need a red dress like that. Love your eye for the pretty! 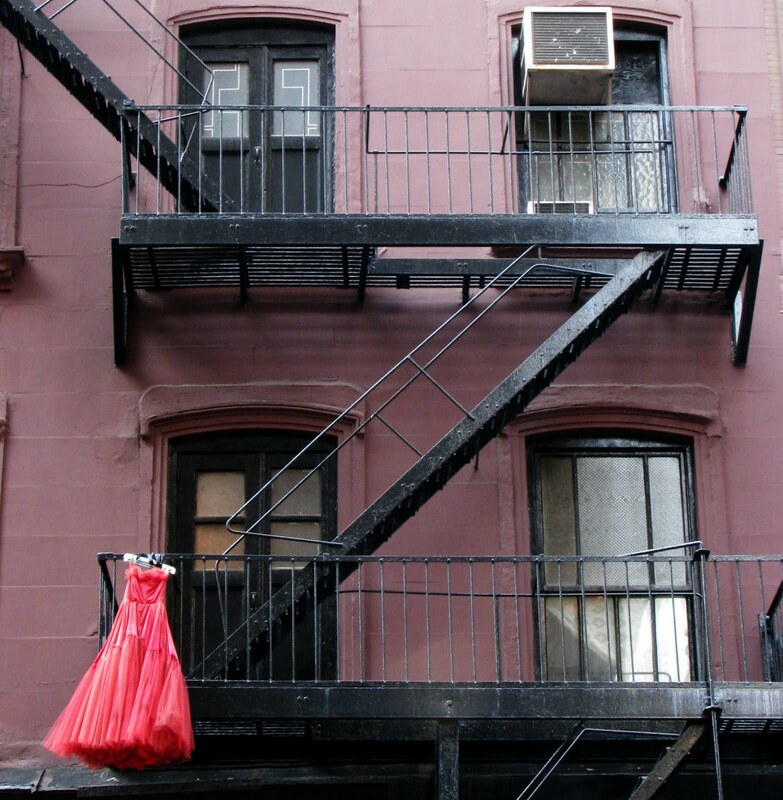 goodness ..the story behind that dress on the fire escape..a wonderful capture ..keep eyes open always!! how random, red dress...i like the new look of your site but i kinda miss seeing the dog photo. This is brilliant, well seen! Really gets you wondering what the story is! Doesn't matter who and why, It is all beauty. the concept and te dress and you finding it! Beautiful pictures where the red dress creates a nice counterpoint. What a wonderful story in photos. What caused you to look up? Maybe you were seeing the city through a camera lens -- like a forensic crime investigator who blocks off crime scenes in squares. I'm enthralled. New GFC Follower, enjoying your blog and eagerly planning to see your next masterpiece. Oh, what a wonderful story! So often I spend my time looking down at my feet or just around them at the sides of the road or sidewalk, that I miss beauty just over my head. This will help remind me to look up more! Hope you have a terrific week! love this so much -- you've really captured the red dress being ignored, and then that billowing skirt! be still my heart. like a great art installation for the observant few. Your first capture is a real stunner! I feel it is the best photo that I have seen you take since I started following your work. Dynamic composition, interesting color harmony, and intriguing story-dreaming/telling piece. Perfect! The last shot is very nice, too. awesome... makes you wonder what it's story is?!?! I absolutely love this, and you have captured it so beautifully! Love it. Your story made it come to life. oh my god...what a capture!! LOVE it! I love this photo story! Wow how fantastic, and beautifully documented.